Wild: Found primarily among the Island's mountain and tundra regions, Arctodus Dirus is an imposing creature. Like most of the creatures that inhabit this island's colder areas, it is a mammal, and this particular mammal is either at or near the top of that region's food chain. 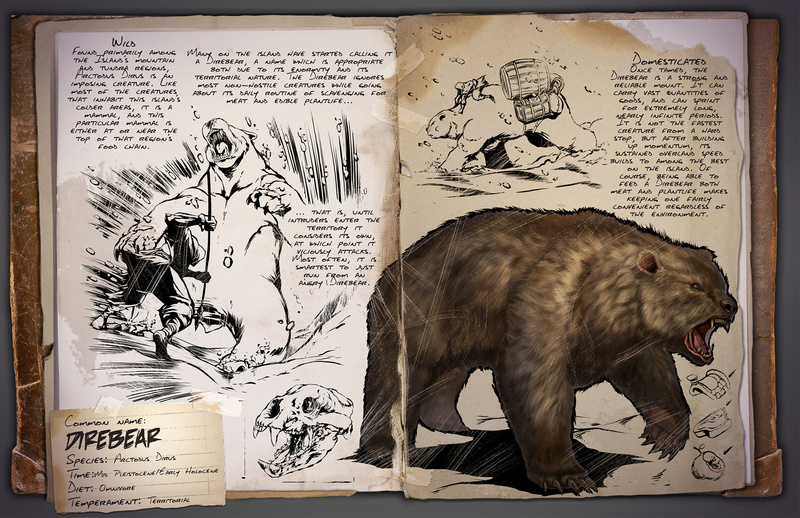 Known Information: Many on the Island have started calling it a Direbear, a name which is appropriate both due to its enormity and its territorial nature. The Direbear ignores most non-hostile creatures while going about its daily routine of scavenging for meat and edible plantlife... ... That is, until intruders enter the territory it considers its own, at which point it viciously attacks. Most often, it is smartest to just run from an angry Direbear.